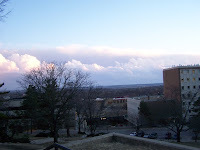 As I was walking home Wednesday evening, I could see the line of thunderstorms that eventually caused up to 4 inches or more of rain in Kansas City. 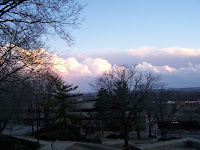 I tried to get pictures that showed the size of this storm, but I could not find a good view. Here are two pictures that do give some sense of the storm. There is a lot of overlap between them and if I had the fancy software I could overlap them myself. But I don't, so you'll have to use your imagination. The storm line carried on for miles in both directions. Pictures from the past week. It was not a great picture week, but I do have a few. Feb. 26 - Lily contemplates why she should pose for me. 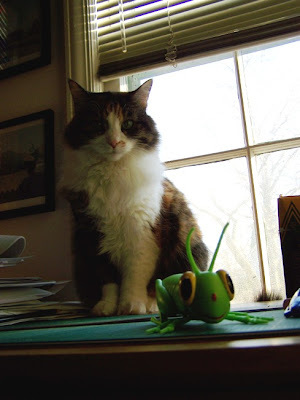 I wanted to take a picture of her and the grasshopper. 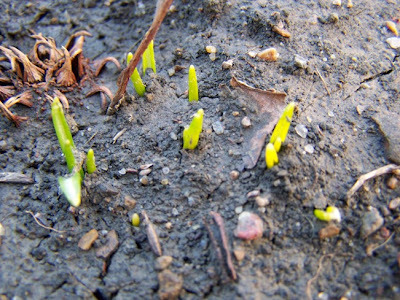 Feb. 27 - New growth poking through the soil. 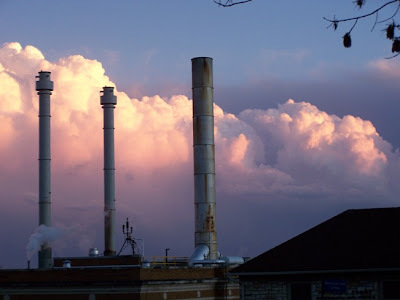 Feb. 28 - Storm clouds and smokestacks.